Browse through our Kitchen & Bathroom portfolio for inspiration from some of our past projects.. 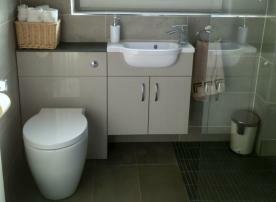 Shades of this seasons most popular colour have been cleverly mixed to create this contemporary ground floor wet room. 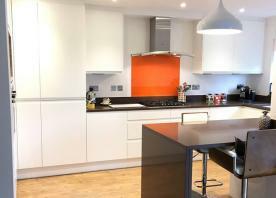 Crisp White walls and cabinets have been contrasted with bursts of vibrant Orange and retro accessories to create this truly stunning Kitchen Diner. 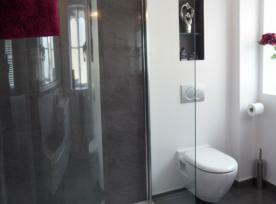 Dramatic Grey's contrasting with Crisp White's and Fuschia accents create a five star en-suite. Charcoal walls, livened up with bursts of Citrus Yellow and Royal blue give a fun and friendly feel to this WC. Shades of beige's, creams and browns have been combined in this Bathroom, En-Suite and Downstairs WC to create truly beautiful and calming spaces. Knocking through the kitchen and living area creates a Ultra Modern and social family space. Please pass on my thanks to Seann, as always I have been very impressed by the quality of his workmanship and delighted with the new look en-suite. Also pleased with the changes I made to the toilet and tap handles. I am thinking about having the kitchen refitted next year, so will be in touch again for a quote in due course. Fantastic all round service! Careful planning and attention to detail has created our wonderful kitchen. Martin and Sean are very helpful, clean and tidy workmen. Thank you Martyn, Sean and Katie. The Kitchen and Bathroom Store came up on a google search and we went along to take a look. Katie and Martyn were both around and listened to what we needed and arranged a site visit. On talking to Martyn we realised that he could also undertake the building works we were going to have done separately which involved removing a load bearing wall – Martyn never tried to “sell” any services and left us to make our own decision. We decided that it would be much better for all the works (building/flooring/plastering/kitchen/Downstairs WC) to be undertaken by Martyn and his team. Katie came up with some amazing designs which were spot on. The whole of our downstairs was transformed in 6 weeks (as confirmed at the outset). Martyn and Sean worked really hard and very professionally at all times – every detail was covered. We would both thoroughly recommend them – Bathroom next! 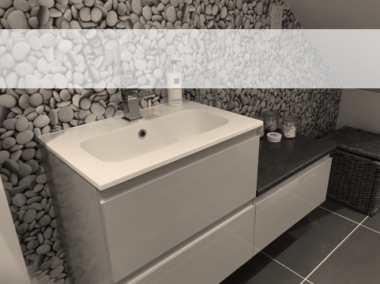 Martyn and Katie provided a friendly and flexible service throughout the entire process, from planning and design through to fitting and after sales support. 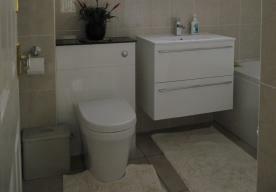 The team’s hard work has resulted in a bathroom that is a real pleasure to use and we would have no hesitation in recommending their services to others. We can highly recommend the services offered by Martyn, Katie, Seann and the team at The Kitchen & Bathroom Store. We were impressed with the way were the whole process was easy and made simple, right from the first meeting, through to the design & planning stages and then the final fit. Excellent job! We recently used the Kitchen & Bathroom Store to replace our bath with a shower. Both Kevin and Martyn worked really hard to install the shower as painlessly and efficiently as possible, when there was a minor issue after the shower had been finished Martyn returned to rectify the problem quickly. We are very pleased with the end result and would have no hesitation in recommending The Kitchen & Bathroom Store. 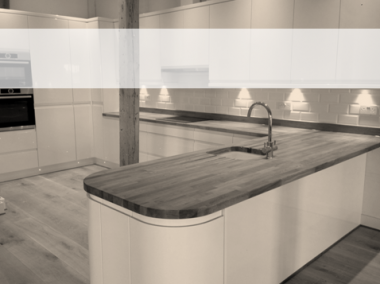 We were most impressed with Katie and Martyn's initial welcome at the Kitchen & Bathroom showroom which was professional, friendly and not in the least pushy. Seann and his team were hardworking and pulled out all the stops to achieve just what we wanted and we are delighted with the finished product. "We are very pleased with the new kitchen and particularly like 'U' shape arrangement of units and worktops on the sink side. Having the breakfast bar in this position is very practical as well as being pleasing and creating a whole new shape to the kitchen. It looks good, is no problem to keep clean and the sink fits in well with the black hob on the opposite side of the room. 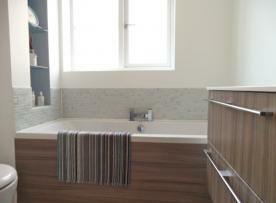 We are very pleased with the design and the quality of the units." 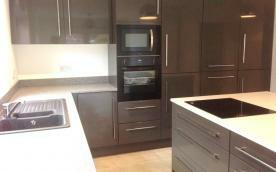 "I would like to say a big thank you to all at Kitchen and bathroom store for giving us a new Kitchen and Bathroom. From their initial visit both Martyn and Katie listened to our needs right down to the colour scheme and the resulting design package was excellent. The team who carried out the transformation were very Professional and friendly and were prepared to change things at the last moment, no problem was too difficult. Both my wife and I are very happy with the end result and have had a lot of wows from friends and family. Well Done a great job"
"Thank you to the Kitchen and Bathroom Store for the superb transformation they gave to our kitchen and bathroom. We had an excellent and efficient service from start to finish. We were very impressed with the excellent customer service, the planning and design was very professional and all the products installed were of very good quality. We are delighted with the service provided both by the showroom and the fitters – a very professional job, well done." "Martyn and his team were fabulous ! I dreaded the thought of modernising my small terrace house as the disruption to such a small house would certainly be chaotic. My friends recommended the kitchen the bathroom Store to me so I booked an appointment for them to come and quote. They are a friendly and professional team headed by Martyn who re-assured me that the bathroom could be refurbished with the mininum of fuss. I was pleased with the drawings he provided and surprised at the price being so competative, I had three quotes in total and choose the kitchen and bathroom Store for their competiveness and friendly approach. The installation team were great too explaining what they would be doing on a daily basis. They coped magnificently in such a small space and with the three animals that watched their every move! I trusted them completely and went to work knowing that they would call if they needed to. 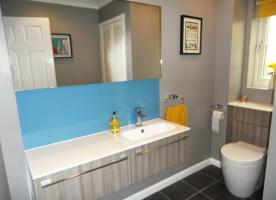 They were clean and tidy and have made my bathroom look great. I have recommended Martyn and his team to my friend, she has now booked them to commence work on her house. I would just like to say thank you to Martyn, Katie and the team for a job well done." "Martyn and Katie from The Kitchen and Bathroom Store produced an excellent design for our en-suite, incorporating a toilet, bidet, double wash basin and a wetroom walk-in shower area.. Seann, who installed it almost single handed, approached the work in a methodical, systematic and thoughtful way with real attention to detail. We are very pleased with the result, and the cost was reasonable too!" 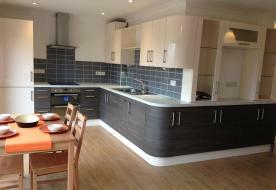 "We are extremely satisfied with our new open plan kitchen. It was clear that Martyn and Katie listened to our requirements when they made their initial visit and they understood what we wanted to achieve. The final product matches the design that we agreed and the units are sturdy and of very high quality. We were pleased that the team were able to manage our additional requests (ie to lay flooring) despite the time pressure to complete the kitchen before Christmas. We debated on the more expensive curved units but they are the first thing that everyone notices when they see our kitchen, they look really impressive. We'd highly recommend this company." "Just wanted to say a quick Thank You for the superb after sales that you have demonstrated. The new valve that was fitted to the pump has cured the cold water issue of the toilet/hand basin and all is working perfectly. We still get comments to this day on the bathroom and how good it looks and we are both delighted with the finished article and how good it looks nearly a year since its installation. Next year we will be looking at redesigning the kitchen and your company will be top of the list"